Keep an eye on my YouTube channel, where I’ll soon be uploading a timelapse of this comic being drawn! It’s a lot of footage, but I’m excited to show you the process behind this one. Mainly, it just took a while. IT’S HERE!! That kooky momentum-crazy speed-runner, Action Henk!, finally got a level editor (and the entire game is $6 until January 2nd, good lord)! Level editors are at their best when they reflect my favorite tenet of game design: “It shall be easy to pick up, while having leagues of inherit depth for those willing to dive.” Or something like that. Henk’s level editor is like when you tried to stack diagonal wooden blocks and rolled a toy car down them, only it actually works and you don’t have to clean up the mess afterward. In short, it’s like childhood! It’s like all those freakin’ Hot Wheels’ track commercials, only now I can own them all and not have to pay a hundred wacky bucks (or whatever I thought my mom used to buy things)! Getting lost in making a level is relaxing, and the ease with which I can create a level equals a quick, satisfying pay-off. Publishing the level to Steam’s Workshop and sharing your creation with others is the, as they say, chilled chocolate curls on the mocha cake. And it’s only in its first, early-access iteration! Bring on them bells-n-whistles! I probably won’t have time to draw another comic in time for Christmas, but I’m definitely aiming to record a couple more holiday videos for the YouTube channel, so I guess look for those over the next couple days. If I don’t see here on KakuJomics before then, HAPPY HOLIDAYS!! Actually, the jump punch isn’t luck. You just need to hit it in the sweet spot. 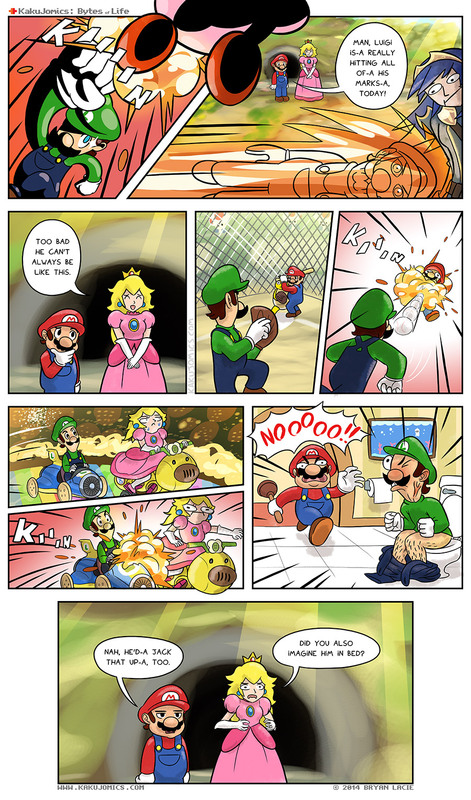 Everyone knows that he’s-a Luigi, number one. Specifically the ladies. What’s this? Kakujomics after dark? Finally. Can’t be all Family Friendly Fun all the time. Why else do you think there’s those subliminal messages in Disney movies? Welcome to the dimly lit side of artist alley. Right next to the Digimon fan fics, but we never look that way- NEVER LOOK THAT WAY. The mexicans are pretty out there.